From Laufen this Pro Rimless Wall Hung Pan is a new design WC that has no rim. 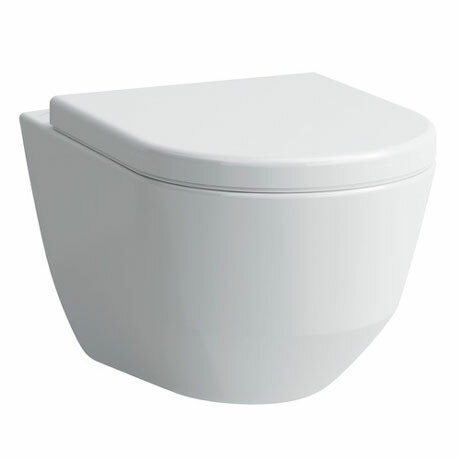 The benefits of this means there is no longer anywhere for dirt, germs and deposits to hide, a sturdy antibacterial seat with chrome hinges is also included, this WC delivers the ultimate level of hygiene control in your bathroom. Both public toilets and private bathrooms can benefit from the easy cleaning and great hygiene of this system. This pan is designed to be used in conjuction with an enclosed/concealed cistern and frame (sold separately). 5 year guarantee. Seat is guaranteed for 1 year.